In the 90's when skateboarding was finding its place in the streets and snowboarding was just starting to take off, Norm and Phil were working and managing the iconic shop Rude Boys in Banff, Alberta. They were the goto guys about anything snowboarding and skateboarding related and still are today. Infamous first opened their doors in the little Co-op mall in Pincher Creek on October 15th 1999. It was build from the ground up on nothing but the drive and passion that still fuels them to this day. After 4 years in Pincher Creek, they made the tough decision to move the shop to Lethbridge on October 1st 2003. 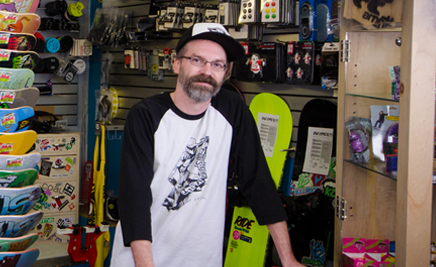 Over ten years they've been in the same location in Lethbridge, with the knowledge and love for skateboarding and snowboarding that has allowed them to work within this industry for over 25 years. Born in the summer of '71 in Winnipeg, Norms love for all things boarding started at a young age. At the age of 7 he got his first skateboard and in 1984 he started snowboarding. This was the beginning of a lifelong obsession. After he graduated from college with a business diploma, Norm packed up and moved to Banff to pursue snowboarding full time. There he went from living in a van being a Snowboard Bum to working at Rude Boys where he worked his way up to manager. He would leave periodically to travel everywhere from Whistler, to L.A, to New Zealand and Australia. After two years in Australia he came back to Banff with the dream to dream to open his own shop. He approached Phil with this idea, having worked well with him before. They then packed up and moved to Pincher Creek to open their shop and ride Castle Mountain. Phil started skating and snowboarding when he was a young child. When he was 14 he got his first job in a skate shop called California Days in Winnipeg, MB. After graduating from high school he moved out to Banff with his best friend. Once he was settled in Banff, Phil met Norm and became friends and eventually co workers. Phil worked at and managed Rude Boys for nearly 10 years when snowboarding was taking off. 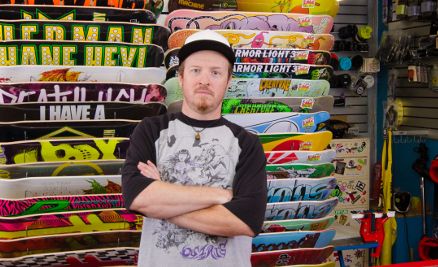 Phil was approached by Norm to open their own skate shop and jumped on board. They researched and rode mountains all over Alberta and fell in love with Castle Mountain instantly. Then they opened the shop in Pincher Creek in 1999.